We offer a wide range of services for clients for Pest Control in East London and Essex including the William Morris Gallery for the London Borough of Waltham Forest in E12, various properties for Regency Estate Management, Rydon or Equipe Regeneration Camden, HBH Foods Enfield, Wannis Cash and Carry Leyton, various Lituanica Retail Stores including Becton, Five Points Brewery Dalston, Wapping High School, Ibis Hotel Leyton, Woodford Baptist Homes Wanstead, Nisa Bow, Porgy Management Barking, Gandhi Oriental Foods Poplar, Mother Advertising and Hollandia UK Ltd in the Docklands. Our pest control in East London services many customers in the food, drink and hospitality industries and many other private or public sector pest control customers throughout East London.We are full members of the British Pest Control Association and have many accreditations including ISO9001. Our aim is to offer a high quality service by giving our technicians the best training in the industry and motivate them by awarding quality bonuses. We expanded our pest control in East London and and South West London into North London and East London and Essex. Gradually we increased our technicians based in East London. In 1999 Graham and David became equal Directors and the business became incorporated as Beaver House Services Ltd. In 2004 we moved into offices in the borough of Wandsworth and then we expanded into larger offices in 2007 where we decided to simplify our name to Beaver Pest Control. We invited Rafal Brymer to become a Director in 2013 and Julia Pittman in 2014. 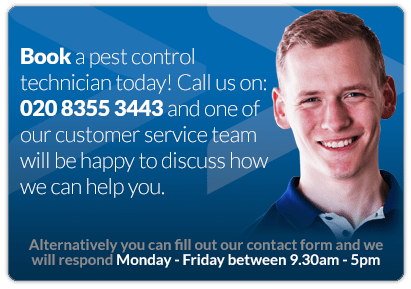 Our pest control in East London covers most pests including wasps, mice, rats, bed bugs, pigeons, clothes moths, ants, cockroaches, stored product insects, squirrels plus many more. From our humble beginnings we are now as active in East London as anywhere else and can even operate on a national scale via our network of excellent BPCA partners.